Mosaic Fertilizer's gypsum stack is filled with acidic wastewater. The one of the reservoir's walls are threatening to break, which could cause severe environmental damage. Q: This reservoir of wastewater is huge. The walls are about 200 feet tall, and there were about 700 million gallons of acidic water in there. Just how close is this thing to rupturing? It’s just not clear at this point, based on what the company and federal and state authorities are saying. The company does say there has been no release of the processed water yet. That’s a good sign. Q: If this wall were to break, what could that do to the surrounding area - people and the environment? The big worry is that a potential spill at that location would get into some of the waterways to the north. You have a canal or two. You have Bayou Des Acadiens and you also have the Blind River. The Blind River connects, eventually, with the Amite River Diversion and Lake Maurepas and it flows through wetlands in between. The water contains small amounts -- and we don’t know exactly how much -- of phosphoric acid and phosphorous. There is also a radium content -- a radioactive element. That content is about three times as high, we’re told, as the drinking water standard. The company says the primary concern is the acidity of that water. They liken it to the acidic levels of lemon juice or vinegar. But that much acidic water could be deadly to a lot of the wetlands vegetation, and could be deadly to fish in those waterways. And anybody drinking contaminated water or eating contaminated wildlife could be affected as well. Q :The company -- Mosaic Fertilizer -- has said that it is taking action. It’s being monitored by state and federal officials. You were there on site this week - what is the company doing to fix the problem? Company officials told me this week that they are doing what they can to move a lot of that water off the top of that stack. They have one pump that’s removing about 10 million gallons of water a day. They tell me they’d like to double that. That’s the primary strategy to remove some of that processed wastewater into other ponds on the plant site. Q: To essentially relieve pressure on the existing walls -- is that the idea? Exactly. They’re also reinforcing that northern wall in particular with a low berm, to try to take some of that pressure off. And digging ditches nearby just to try to hold any potential flow at the site. Q :This company has been under scrutiny for years. According to your reporting, in 2015 Mosaic reached a settlement with the federal government to clean up several of their sites in both Louisiana and Florida. As far as we know, was the company actually doing that? As far as we know, yes. The company had to put hundreds of millions of dollars in financial assurance for eventual plant closures and cleanups at the sites here and in Florida. 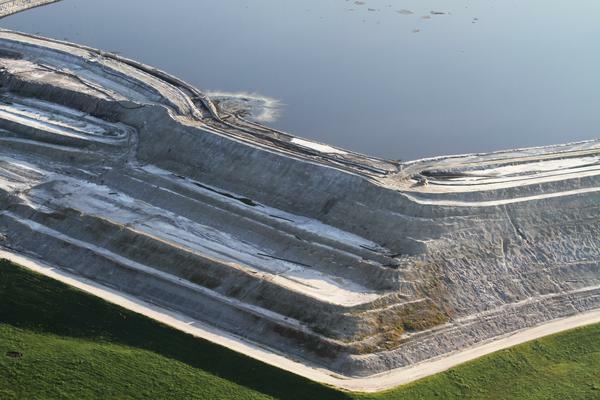 Our own Louisiana Department of Environmental Quality told The Lens this week that Mosaic’s method of storing that phosphogypsum waste and the processed water is in compliance with the consent decree. This really all points to a lot of the difficulty of dealing with all this waste from fertilizer production. One of Mosaic’s predecessor companies, Freeport-McMoRan, wanted to dump this type of material into the Mississippi River in the 70s and 80s. That practice was blocked - a lot of the people who depend on the river for water protested very loudly. So right now what we’re left with, in a lot of locations, are these huge stacks of gypsum waste and huge reservoirs of processed water. You can hear an extended interview between Tom Wright and Mosaic senior director of gypsum engineering David Jellerson, on the latest episode of Behind The Lens -- a weekly podcast from The Lens.